Thank you Netgalley and Algonquin Young Readers for my eARC copy of this book. I'm not really sure what to make of this novel. The writing is spectacular. I'd say it's probably among the best I've ever read. It's such a powerful book that I can't find the right words to describe my feelings about it. 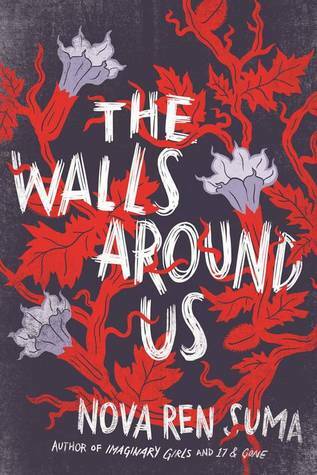 Reading The Walls Around Us was quite the hypnotic experience. This book has chilled me to my core and I'm pretty sure that was Nova Ren Suma's intention. The ending really threw me for a loop and I can't seem to make sense of it. This book was so well-executed I feel as if I have to blame myself (at least partially) for my lack of understanding of its ending. 1) Summa's writing style is just insane. She literally puts you into the shoes of each of her characters. You feel as if you are that character. You're in their mind, feeling and thinking everything that they are. It's amazing. 2) This is such and powerful and painfully realistic story. Forgetting the ending, there is so much reality in this book it feels like I'm reading nonfiction. Except unlike a lot of nonfiction, it isn't just factual. It's emotionally evocative. 1) I can't make sense of the ending. It's so paranormal that I can't mesh it in with the rest of the plot. Like I said above though, it's probably something lacking in me than in the actual book. 1) "I'm going to be prima ballerina someday," I told her. It was something I used to tell everyone back then, until it became so obvious, years later, and everyone started telling me. "You will," she said. She didn't announce that she was, too. "I'm gonna be famous. I write it down every night, so in the morning it knows to come true." "That's a good idea," she said. She looked at me oddly, and now it hangs heavy over me, like even when she had no future. "I don't know yet," was all she said. 2) "Never again would Ori build a blanket fort with me. And never again would we hide under the blanket fort like little kids. Never again would Ori paint my toenails purple to match a purple bruise. Never again would Ori do one-bite, my-bite, two-bite, your-bite with a bowl of Cheerios. Never again would I catch Ori doing the sweet things she sometimes did for perfect strangers, and make fun of her for them, like holding doors for slow, decrepit randoms and looking all over the neighborhood for the whiny brat's overweight dog. Never again would Ori step on a stage and wow an audience to tears. Never again would Ori shake her head and get embarrassed when they said how perfect she was. How incredible. How stunning. How transcendent. Transcendent--they actually used that word. Never again would she ask me to please stop talking about it, and never again would I say, 'Did you see how they looked at you? It's like you're the next Anna Pavlova.' Never again would she ask me, hours later, timid and shaky voiced, 'Vee, you're not feeling weird about what they said about me, are you? You'd tell me, wouldn't you?' And never again would I have to lie through my straight teeth--hers were crooked, she really should have gotten braces--and say, 'I'm okay--don't worry about me. I'm fine.' Never again." 3) "It was easy to know what was the matter, why I sobbed. Miss Willow had selected Ori to advance to pointe, which meant a whole new kind of training, plus separate special classes three times a week, and she hadn't selected me. I needed more time to strengthen my ankles, she'd said. But Ori's ankles were ready. Mine were still wimpy spaghetti ankles of a little girl. Any other friend would have patted me on the back and assured me my time would be soon, but Ori made a promise, and she always kept her promises. She said she wouldn't go on pointe until the day I got to. She wouldn't wear the perfect pointe shoes Miss Willow had gifted her in charity because her dad wouldn't have paid a dime for them until I had my own pink satin pair. I remember her fingers drawing down on my spine. I remember her cheek on my cheek. I remember how she said, "Anything I do, you'll get to do, too." How she said, "I won't do it until Miss Willow says you're ready. I'll wait for you." She did wait. She waited six and a half months for me and my ankles to catch up to hers. And she didn't even bug me about it even once."